Judge Neil Gorsuch arrives for the first day of his Supreme Court confirmation hearing before the Senate Judiciary Committee on March 20, 2017. Maryland's senators said they'll vote against the nomination of Judge Neil Gorsuch to fill the vacancy on the Supreme Court. Sens. Ben Cardin and Chris Van Hollen, both Democrats, said in statements Tuesday that they will oppose Gorsuch's nomination. Cardin said he's "greatly troubled" by Gorsuch's record. He said he found examples of Gorsuch "putting corporate interests before working Americans, showing hostility to agency decisions that protect our environment, disregard for women's health, marginalizing students with disabilities and many more troubling decisions." 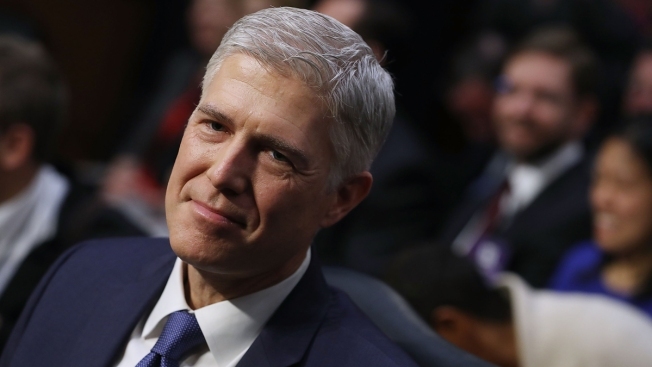 He said Gorsuch wouldn't be an independent check on President Donald Trump. Van Hollen said Gorsuch "consistently sides with powerful special interests against the rights of individuals, workers, and consumers." Senate Democrats forced a delay in a Judiciary Committee vote on Gorsuch, pushing it back to April 3.